Fiocchi’s line of Shooting Dynamics ammunition is suited for all sorts of shooters needs. They have multiple ammunition designs, types of ammo, and calibers available. 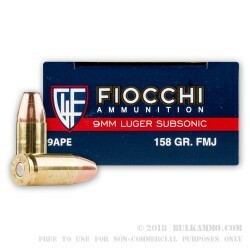 These 9mm Luger (or 9x19) Fiocchi rounds are 158 grain, Full Metal Jacket, and loaded to Subsonic velocity levels so they are perfect for use with suppressors. 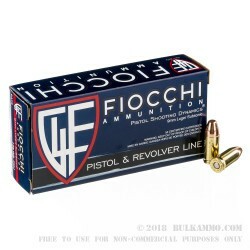 Fiocchi reports this ammo’s muzzle velocity is about 850 feet per second and these rounds hit with a muzzle energy of about 253-foot pounds. 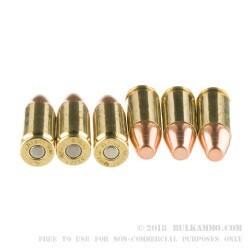 These FMJ subsonic bullets are loaded into brand new, reloadable, non-corrosive Boxer primed, high polished brass cases. Ideally suited for use in suppressors, the Fiocchi 9mm Luger Subsonic rounds were designed to run with a reduced recoil impulse. The 158 grain full metal jacket rounds are heavier than most factory 9mm bullets, but they were designed to feed reliably in various types of handguns, submachine guns, and even 9mm rifles. These cartridges come packed up tight in 50 round boxes, with 20 boxes per 1000 round case. They are ideal for your next excursion to the pistol range for target shooting, testing out a new suppressor you just got your tax stamp for, or for shooting a suppressed pistol in competition. Get your case today! 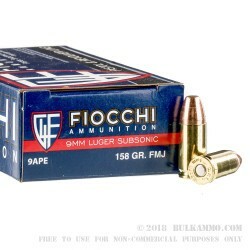 I've used 9mm Fiochi in many weights. The 158 gr has low recoil, esp compared to a 115 gr load. I have better accuracy at 30' and 40'. Q: is this subsonic as the picture shows? it does not say it is subsonic in the description. thank you! A: Hello Stephen, This 158 grain 9mm round is loaded to subsonic velocities.